Australians enjoy a variety of foods. In addition, a new interest in foods gleaned from nature by the earlier native Aborigine populations is gaining ground. Take-a-way foods from various ethnic groups offer variety as well, but several foods remain embedded in the country's cultural cuisine as true food icons of Australia. Bush Tucker is food from the land and natural rainforest habitat. It is considered the original food of the Australian aboriginal tribes. With mainstays such as lizards or the large larvae of wichetty grubs, most of these foods are not eaten by the non-aboriginal population. However, some more adventuresome Australians enjoy milder versions of bush tucker foods. For example, some restaurants throughout Australia serve crocodile and kangaroo meat now. Other bush tucker foods are widely used, for instance, fruits are used for making jams. Cyril P Callister, a food technologist created Vegemite in 1922. Developed from yeast remaining after processing beer, Australians eat Vegemite as a spread for bread. In addition, cooks use Vegemite to add flavor to their dishes. Originally, it was a food high in salt. However, the salt content has since been reduced. Now with less salt and full of B vitamins and niacin, it is considered healthy as well as delicious by most Australians. Lamington cake, or Lemington as it is sometimes called, is a favorite desert of Australians. There are several stories about how the cake came to be. One belief is that Lord Lamington, a former Queensland governor contributed to the name of the cake because they resembled the hats that he wore. Before 1910 the cake was one regular sized cake. Since then bite sized versions are also made. The cake itself consists of a square of sponge cake, covered in chocolate which in turn is covered with coconut. Not only is it a favorite desert, the cake is so well liked that Australians, especially charitable groups celebrate the cake on July 21st each year. Charities use this day named "National Lamington Day" to sell the cakes to raise funds for their charity. According to the Australian Government Department of Foreign Affairs and Trade, Australians consume an estimated 260 million meat pies annually. 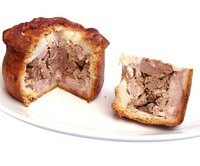 The filled short-crust pie is 15cm in diameter and filled with meats and gravy. Fairs, festivals and any place large crowds gather offer the pies for sale, usually accompanied by ketchup. What Are the Staple Foods of America?